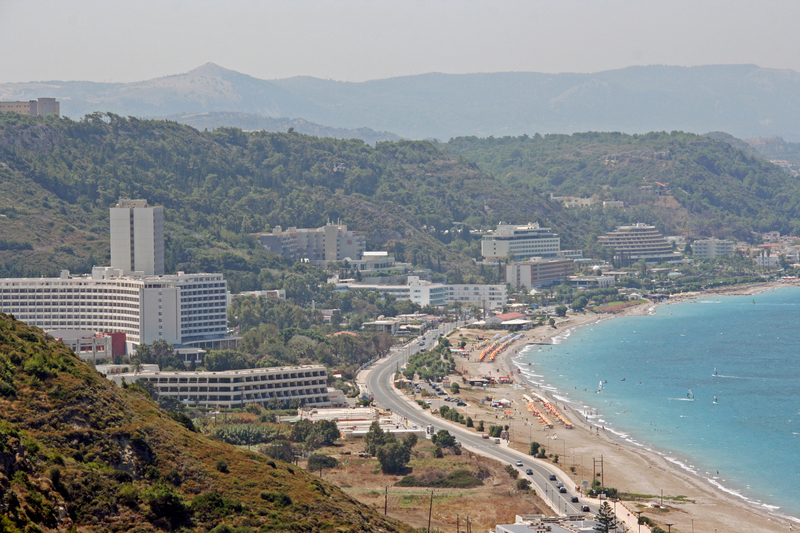 Rhodes, (Rodos) is one of the most beautiful of the Greek Islands. Situated in the gorgeous Aegean Sea and the largest of the Dodecanese islands, it’s actually closer to Turkey than it is to mainland Greece. 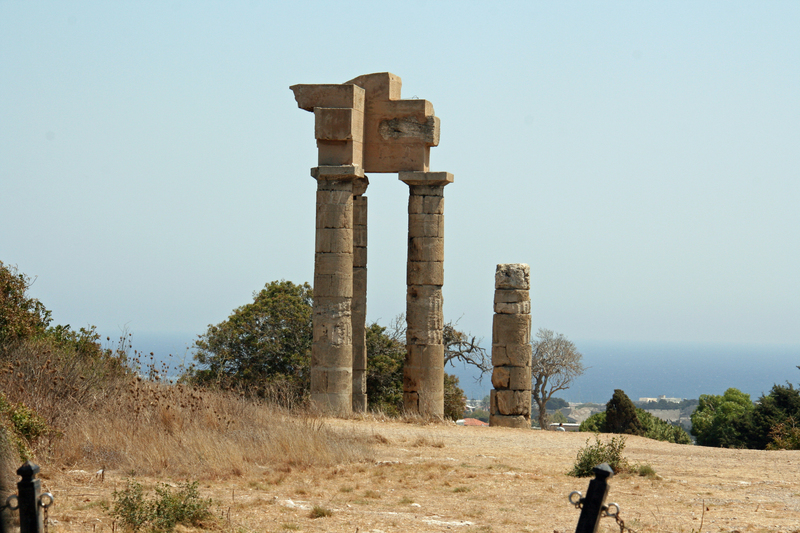 We have traveled to Greece several times, primarily to Athens, Mykonos and Santorini, and somehow had never made it to Rhodes, until last summer. And boy am I glad we finally made it. Crepes with white and milk chocolate. Our daughter enjoying the heated private pool on our balcony. 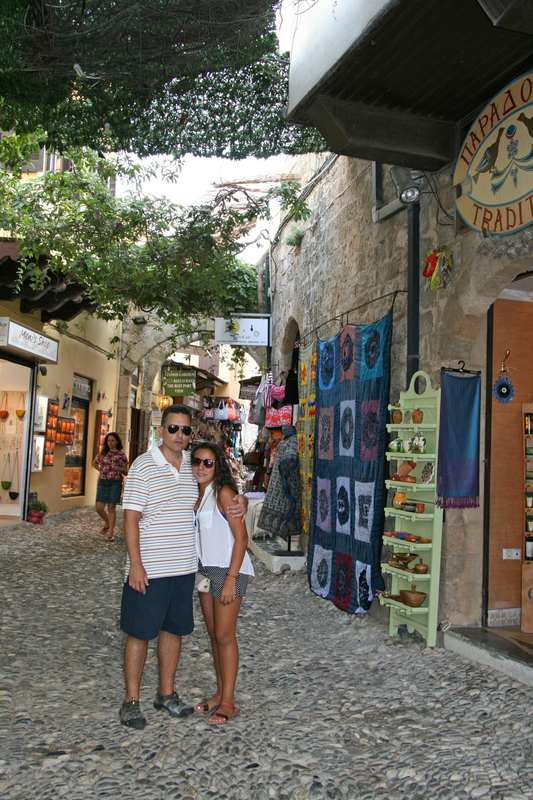 The Old Medieval Town of Rhodes, a UNESCO World Heritage Site, is the oldest continuously inhabited medieval town in Europe. To wander through the town is a unique experience for all to enjoy, since it’s mostly a pedestrian area, with streets full of shops and restaurants. Although the back streets are mostly residential, particularly in the Jewish Quarter. 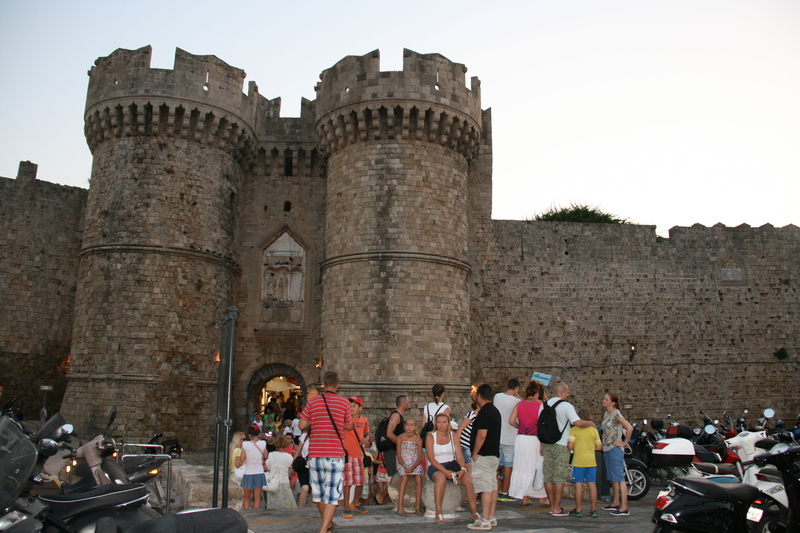 The town is surrounded by medieval walls with several gates as entry points, most folks enter through Marine Gate, the main entrance to the town from the harbor. Inside of these walls are roughly 200 streets or lanes that simply have no name. However, in my opinion, getting lost and wandering around the streets is half the fun. It reminds me of the winding streets of Mykonos, which also have no rhyme or reason. The entrance through Marine Gate. 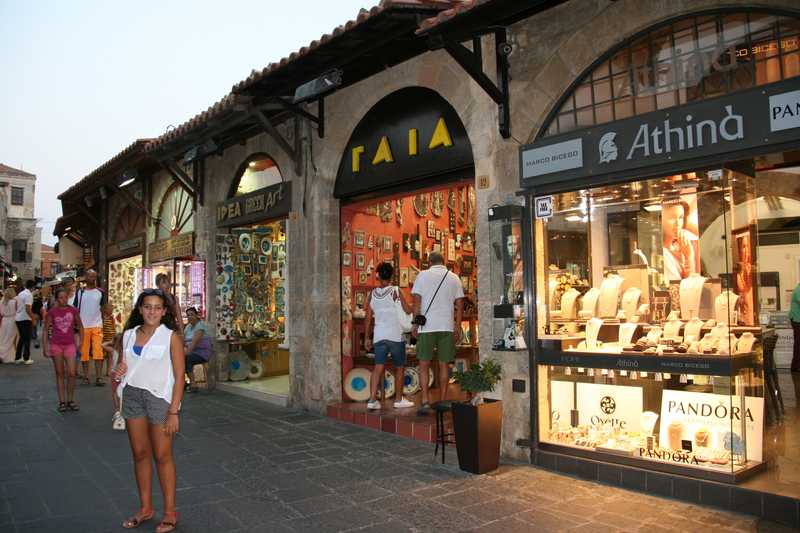 The largest shopping streets appear to be Orffeos, Socratous and Aristotelous. 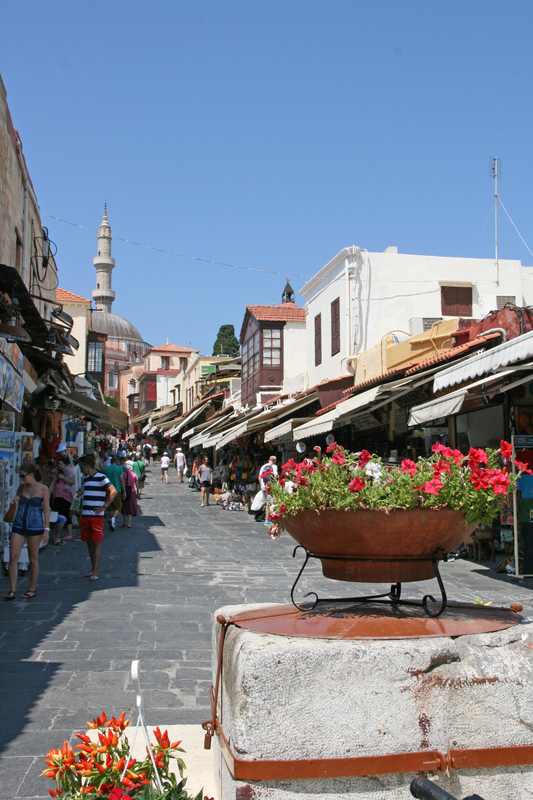 Orffeos Street is a wide road with tourist shops and restaurants near the Gate of Saint Anthony, which connects with Socratous Street, the main shopping street of the old town. This becomes Aristotelous Street when you get to Ippokratous Square, the main square in front of Marine Gate, which surrounds a modest Castellania fountain, and is framed by the old Chadrevan mosque on the west and the Palace of the Castellan on the east. All around, coffee shops and restaurants are bustling with tourists hanging around, eating ice cream, sipping drinks and snapping a million photographs. 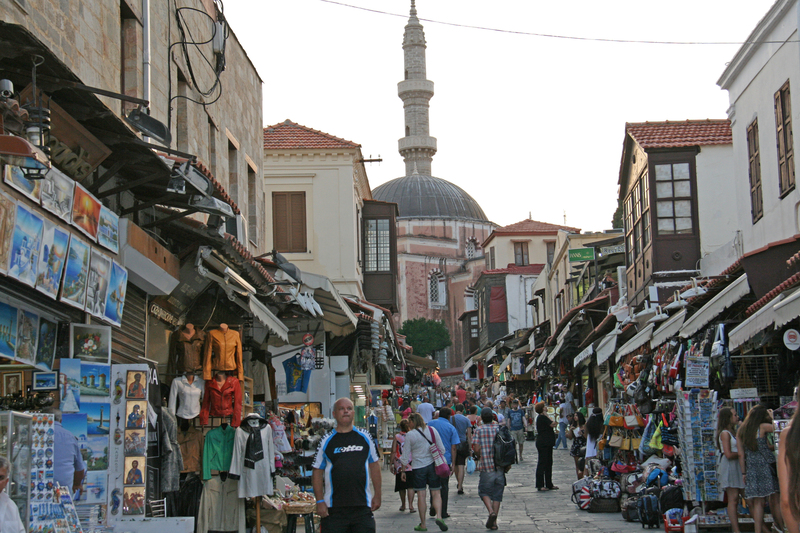 Shops on Socratous Street with the Suleiman Mosque in the background. My daughter not knowing where to go next? 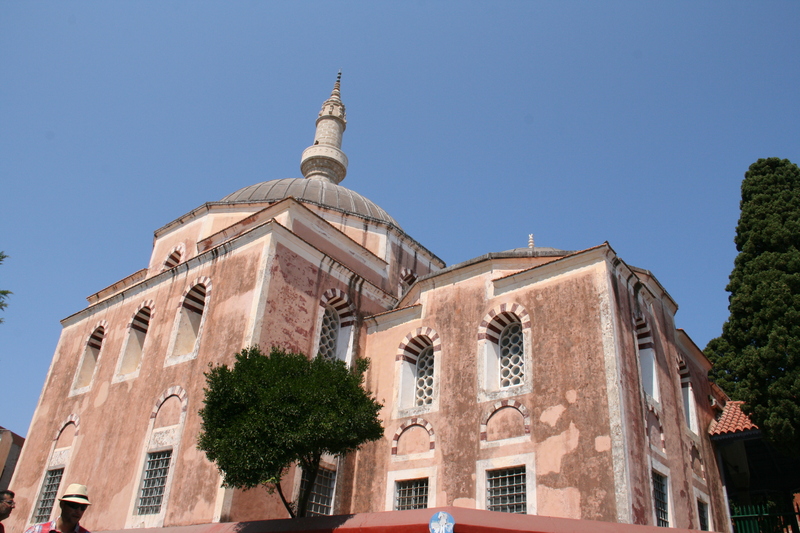 Beautiful Suleiman Mosque, located on the town’s hill at the end of Socratous street. Ippokratous Square, the main commercial hub of the old town. Gorgeous ceramic pottery sold at various stores. Another view of the shops. A view of the harbor from St. Catherine’s gate. A view of one of the island’s beaches. View of the Acropolis of Rhodes from the taxi. I would also strongly recommend if time permits, to take a day trip to Lindos and to also visit the nearby island of Symi. 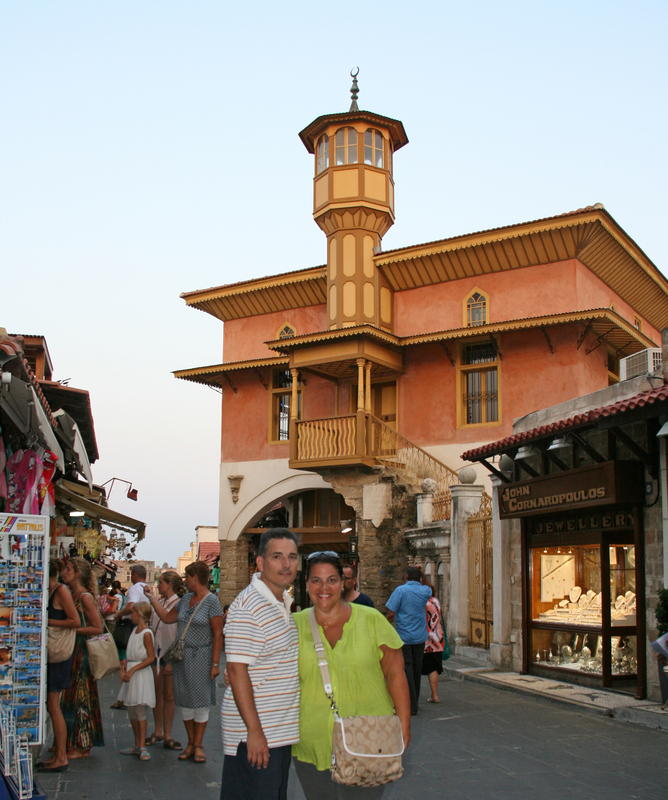 Unfortunately we ran out of time, but both places are high on our bucket list when we return to Rhodes. And don’t worry about driving if you aren’t renting a car, there are plenty of bus and ferry excursions available. I have never been to Greece or the Greek Islands, but it sounds like a wonderful place to visit. Your pictures are fantastic. I have not been to any of the Greek Islands, but I’ve always wanted to go. After reading your post and looking at your beautiful photos, I really want to go now more than ever. 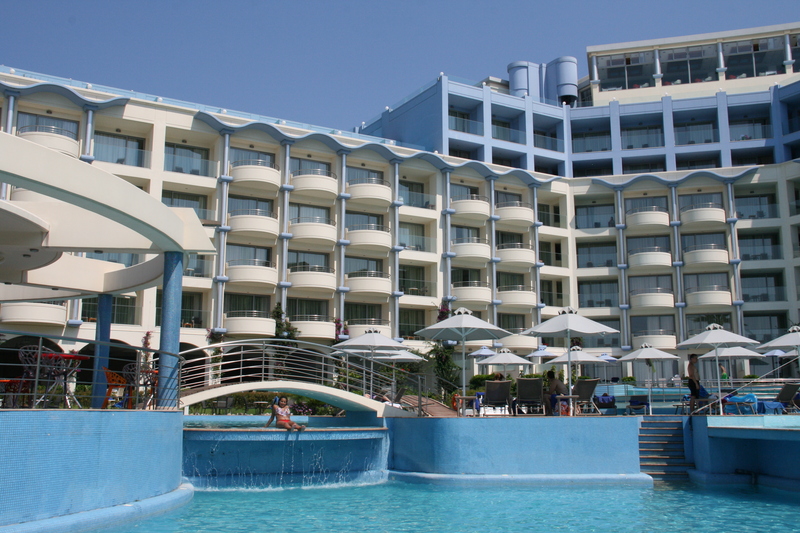 What a great resort and private pool! I can see why you loved it! The Greek Islands look beautiful! This is definitely now on my bucket list. Love all the shopping areas and pictures. I’d love to visit one of the Greek islands. 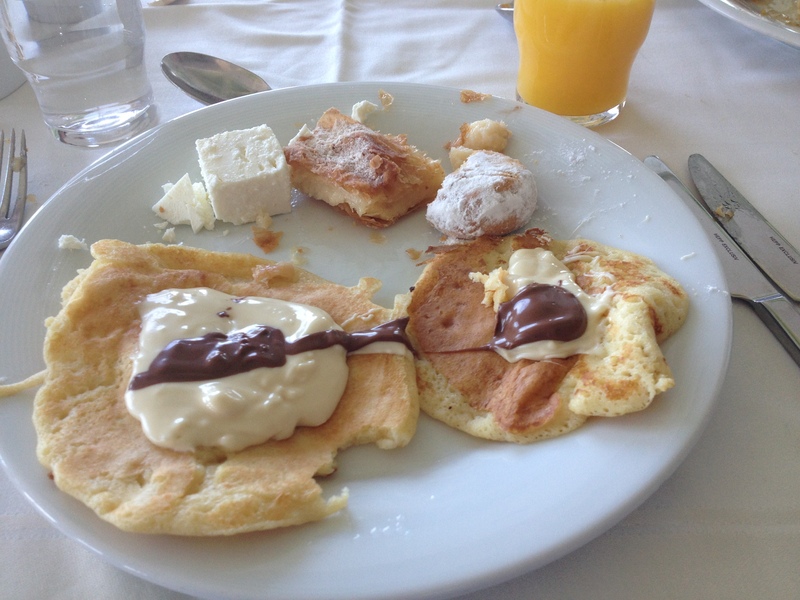 The picture of the crepes with chocolate looks delicious and that resort looks fabulous!! Looks like fun. I love the idea of a pool on the balcony. Makes the whole exprince more enjoyable. Okay, I’m packed and ready to go! Those pictures are gorgeous. That pool looks amazing! Wow, what a beautiful place to visit! Now I’m dying to go there. I’d really like to make it out there too. I haven’t been able to go to Europe since High School. Breathtaking images! I need to get to Rhodes. I can’t get enough of Greece! Gorgeous pictures! Looks like an amazing trip! Now that looks like an amazing trip! Love the photos! This truly is beautiful. Your pictures are amazing. It sounds like you guys did a ton of exploring! 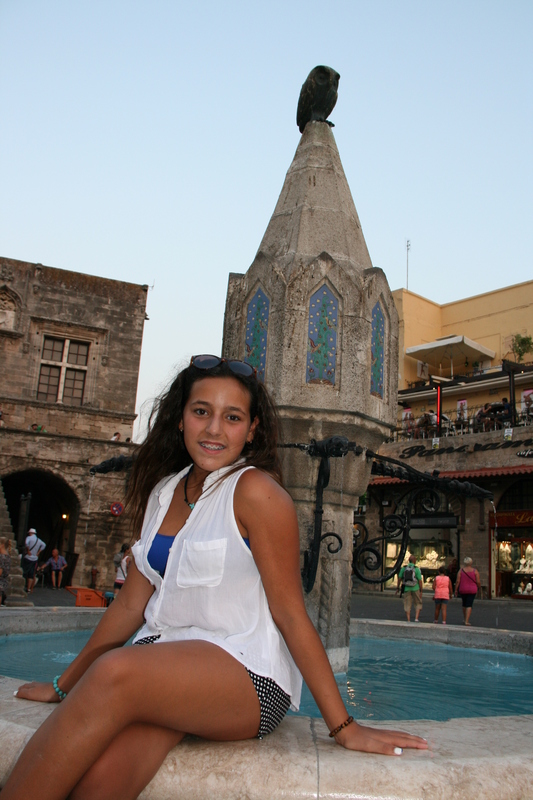 Rhodes is such a beautiful place, I went a couple of years ago it was so hot! I stayed in Pastida. Yep, I’d love it too. How wonderful these photos are it looks like a really amazing place. I would love to visit myself. Bucket list place to visit! Wow! So beautiful. Thanks for sharing such a beautiful place. Wow! Rhodes is just breathtaking. 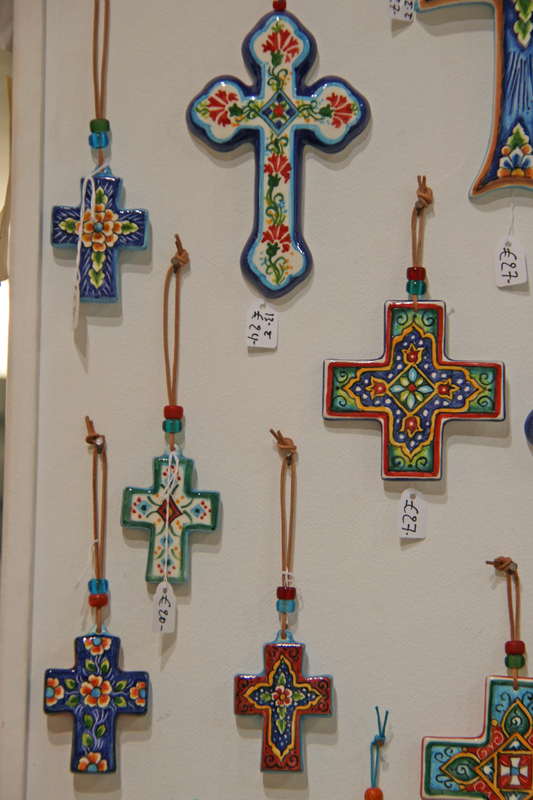 I think those crosses in the little shop are gorgeous. I’m so jealous of your travels! Everything is, of course, picture perfect! And as great as your photos are, I bet they hardly do the place justice! Enjoy your next trip! You are so lucky, I LOVE Greece! I’ve only been to Zante so far but I would love to go back. I hope you enjoy your next trip – I can’t wait to see your photos! 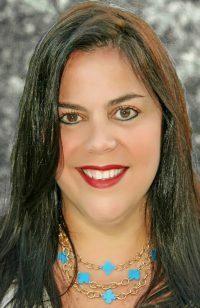 What a great tour Greece is a beautiful country I wish someday we can go to the Greek island cruise. Rhodes looks like an incredible place. The hotel looks amazing! The pools are dreamy! The shops have such beautiful stuff. 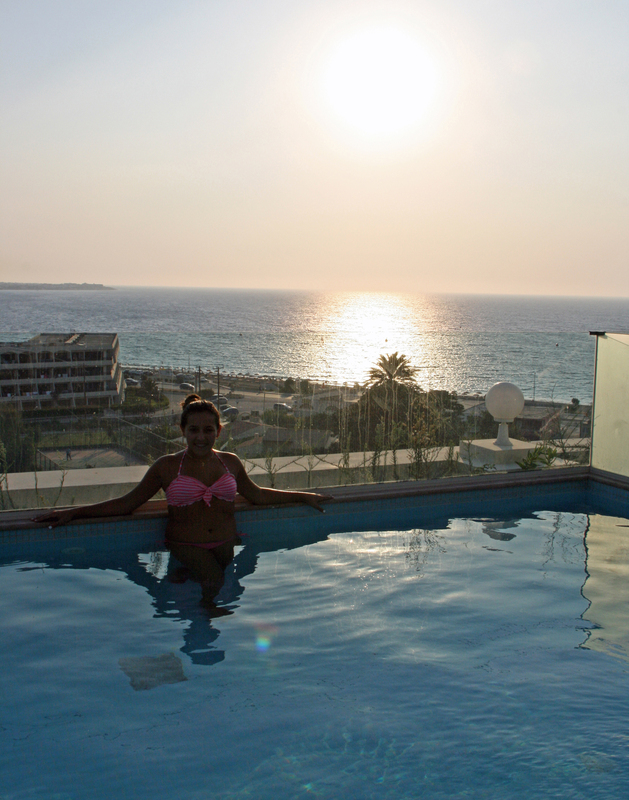 I definitely need to make it to Rhodes one day! This is such amazing trip. I have never been over seas, but this is definitely on my bucket list. Your accommodations were awesome. Your photos are breathtaking. I have never been to Greece, but I would love to visit it one day. What a lovely place to visit, was never on my radar but it is now, truly beautiful. Looks like it was a majestic trip! Oh how beautiful it is there and you got some great shots as well. I might have to add this to my bucket list. Greece is a beautiful country. I want to visit there someday in the future. I’d like to go to their museums. I love the streets of this island. So much culture and history, I bet! Wow, It sounds like a wonderful place to visit… All the pictures are stunning!!! What an amazing place to visit. I love visiting older towns like this, the history is amazing. 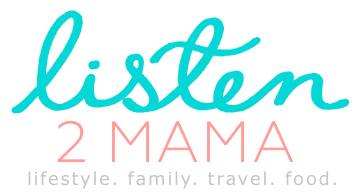 I just added this to my bucket list because I’d never considered vacationing there before. After seeing your photos I’d love to go. What a stunning place and the water is so tempting. I could just dive in. Living in Europe for at least a year is on my bucket list! Rhodes is absolutely beautiful. The private pool on your balcony overlooking that view must have been amazing. There are so many gorgeous vistas in Greece! This is a nice discovery apart from the regular sites of Greece. 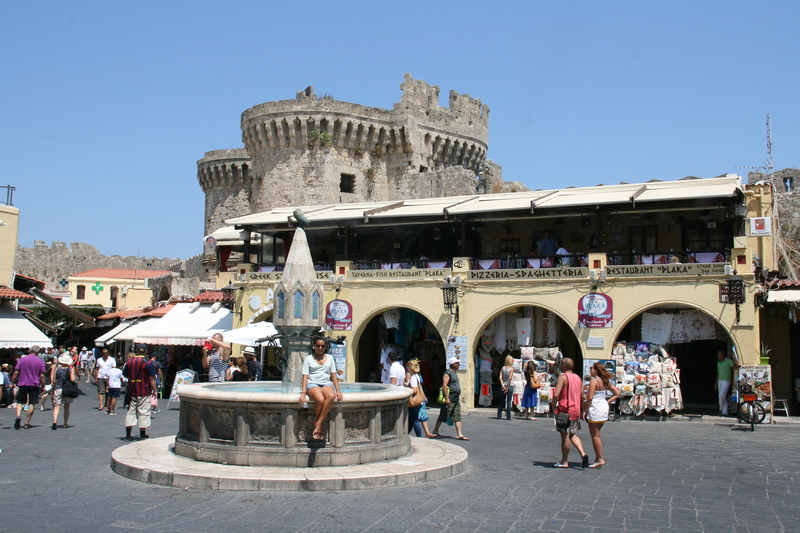 Old Medieval Town of Rhodes would really feel like a tour of the medieval times and I am such a big fan of heritage sites. What an amazing looking place to visit! I can’t wait to hop over the pond one day! This looks like it was a fantastic trip. I have always wanted to go to the Greek Islands. I would love to have a private pool with our room. These are amazing photos. What a beautiful place to have traveled to. 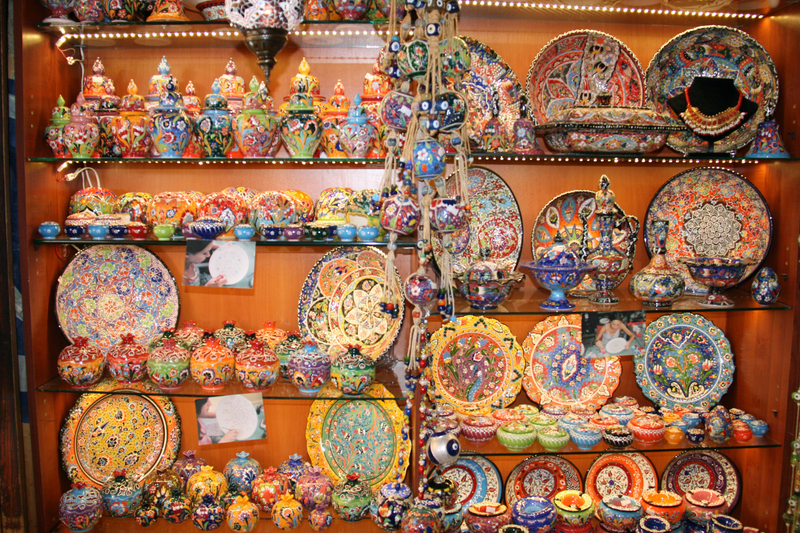 The ceramic dishes in the little shops were simply gorgeous. My kids would LOVE to have a private pool on the balcony of our room. I can only imagine how beautiful this island is…when I went here years ago I went to Aegina, Poros, and Hydra and they were beautiful…but from what I’ve heard, nowhere near as beautiful as the rest of them! I have always wanted to visit Hydra, I’ve seen photos and it looks gorgeous! Wow … all the pictures are gorgeous. I don’t think I would ever get out of the pool especially a heated one. I would like to visit Greece someday. Gorgeous photos. I am going add the Greek Islands to my bucket list. What an amazing trip! 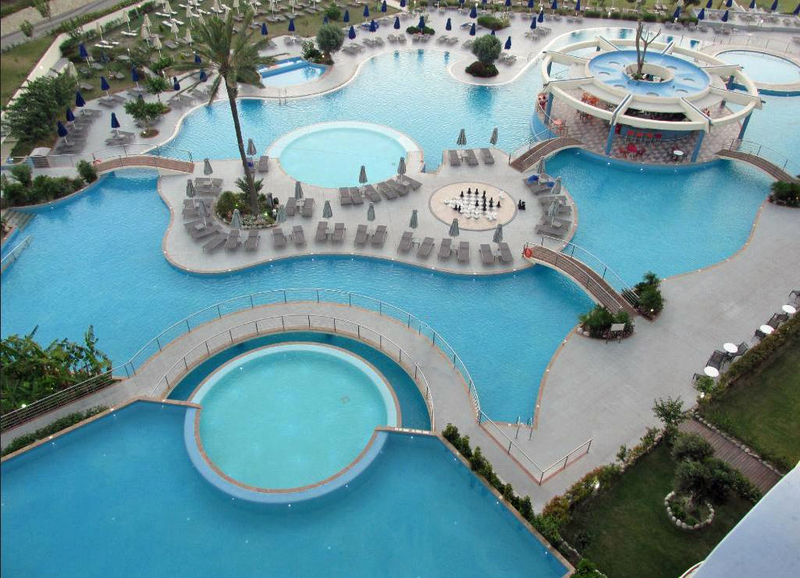 Those pools and the food… Yum! And the streets look whimsical. This is just amazing, the pictures are very much enough to explain the beauty of Greek islands. I would just love spending some time in that heated private pool & more time on those awesome shopping streets. I am sure you had a great trip. It looks so beautiful and magical place that I would love to go to.